A few weeks ago I ran across these post- it letters in a clearance bin at the store. I had nothing in particular planned for them but the pack included the whole alphabet and I was confident we could find something fun to do with them. So when the Bee suggested painting the other day I got them out and we gave them a shot. She selected to only use the M. I am not sure why but I wasn't going to argue. 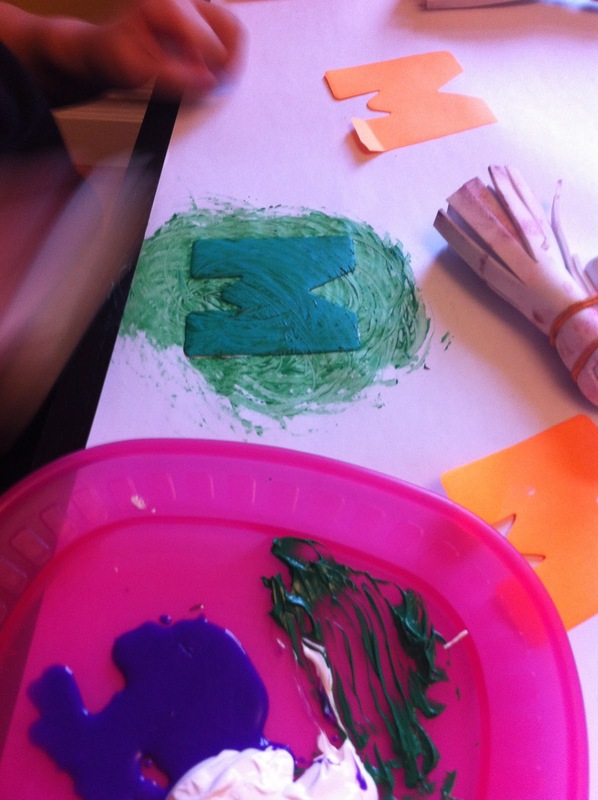 After laying the M's out on her paper, she selected some paint colors that I poured out onto a plate. The she started painting using some of our DIY paint brushes and some foam rollers. I mentioned that she could paint right over the letters and then got distracted by The Bean for a few minutes. In true kid fashion, she had taken my directions literally and had painted only over the letters. When I explained that she could paint the whole paper, and not just directly over the letters she immediately grabbed the roller and filled the whole paper. The magic part was after she finished painting and she peeled up the post-its to reveal the white letter underneath. She was amazed at how that had happened!